Tanzania has a rapidly expanding population which currently stands at over 50 million people. Arusha, the capital city and economic hub of the Arusha Region, is home to many public primary and secondary schools which, due to the nature of the demography of the area, are largely under staffed, overcrowded and poorly resourced. The focus of this module is to develop an understanding of how to implement student-centered education at a public primary school level despite these challenges. Students will be based at Kisimani Primary School, one of only 11 primary schools in Tanzania that teach the government curriculum in English, as opposed to Kiswahili. This gives students from Kisimani Primary School a competitive advantage when making the transition to secondary school as all public secondary schools are taught in English. Despite the previously mentioned challenges facing the public schools, Kisimani Primary School is committed to transitioning from the use of traditional education approaches to a more student-centered style of teaching and learning. A unique partnership between the local community, central government and an American non-profit organization supports Kisimani’s mission to raise the bar for government primary schools and to show what is possible when we invest in education and teacher training. Our student groups engage with teachers and pupils to assist in this important endeavor. This module is based in Arusha, the capital city of the Arusha Region in Northern Tanzania. Arusha sits in the shadow of Mt. Meru, on the edge of the eastern branch of the Great African Rift Valley and acts as a very important hub for the East African Community, the African Court on Human and Peoples’ Rights and the Tanzanian tourism industry. Arusha, a culturally diverse city with a majority Tanzanian population from a variety of backgrounds (including indigenous African, Arab-Tanzanian and Indian-Tanzanian), provides the perfect location and environment for this study abroad module. The main religions represented in the region include Christianity, Islam and Hinduism. The city’s strategic position allows easy access to Tanzania’s most famous National Parks, such as Ngorongoro Crater, the Serengeti and Mt. Kilimanjaro. The accommodations included are very comfortable and secure, and provide excellent “home away from home” bases for the program. All rooms have en-suite bathrooms. Hearty meals, hot showers and meeting rooms are also provided. Free WIFI is available in public areas. Leah is an entrepreneur, actress and former teacher who first fell in love with Tanzania as a volunteer teacher in 2008. She met the community leaders and parents in Mkonoo village in 2010. When she learned how many of their children were not attending school because the nearest public school was 7-11 kilometers away, and their families could not afford to pay school fees for a closer private school, she decided to help. The village donated land, the government agreed to provide teachers and follow English language curriculum and Leah fundraised to build the first 4 classrooms of what is now Kisimani School. Leah is passionate about education, and equally passionate about the ‘teach a man to fish’ philosophy: she facilitates contributions to the development of the school only when the government and community do the same. 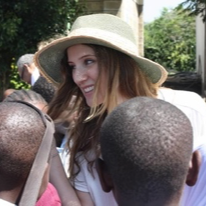 Leah currently lives in Arusha with her husband, Aidan, their 3 year old son, Kieran and new baby Ayla. James Losioki is a teacher, and teacher trainer with an advanced degree from Makumira College in Usa River, Tanzania. He was the teacher coordinator at the school where Leah volunteered in 2008 and has been donating his time to Kisimani School since its inception. He was instrumental in finding the community in Mkonoo village, negotiating the vision for our school with the municipal government, and reporting on the current events at school to Leah when she is not in Tanzania. He also provides additional support to Kisimani’s teachers, leading them in professional development training. 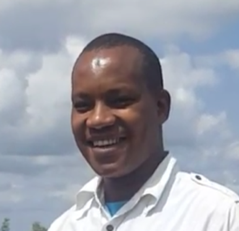 He lives in Arusha with his wife and young son, Tom.